A road in central Norway, closed indefinitely for grazing reindeer, has reopened after just a couple of days. The Jaguar F-TYPE is lavished with the finest French leatherwork. Belgian police reap a bumper crop of speeders during the smog alert, an event that also offered a challenge to classic jam theory . Everybody pays the highest fuel tax in Europe it seems, and an Olympics and Grand Prix road builder goes bust. Migrating herd moves south in time for the weekend. A photo from 2007 shows how the herd is put off crossing Highway 7. Photo via Norway Environment Directorate. A road in south central Norway has reopened after closing on Wednesday for a herd of reindeer. Highway 7 crosses the Hardangervidda plateau, home to around 11,000 reindeer, the last wild herds in Europe. Scientists are concerned that the road acts as a barrier to the animals as they look for new pastures. By special agreement with parliament, Highway 7 can be closed when more than 1,000 reindeer are within seven kilometers of the road for more than twelve hours. This is the first time the arrangement has been used. The road was closed indefinitely. The herd of over 2,000 beasts has now moved further south into a valley where they will not be disturbed by traffic, though they will be monitored via GPS receivers over the weekend. Traffic is being let through in columns, a technique commonly used in Norway, at low speed behind council vehicles. Also today: an Arctic Buss Lofoten coach carrying forty British passengers was blown of the E10 at Stora on its way to Narvik in northern Norway this morning. Five passengers were injured, two seriously. As the rest of Europe basks in spring-like weather, Scandinavia has suffered high winds, snow and avalanche warnings this week, especially the western side of Norway. The British Embassy says it is aware of the incident. To mark the opening of its first UK shop, on Mount Street in London, long lived French luggage maker Moynat has designed a bespoke suitcase to fit the famously snug boot of the Jaguar F-TYPE. A one-off so far, constructed from eight layers of wood, covered with slate grey leather to match the boot’s interior and lined with Moynat’s signature tangerine hide. 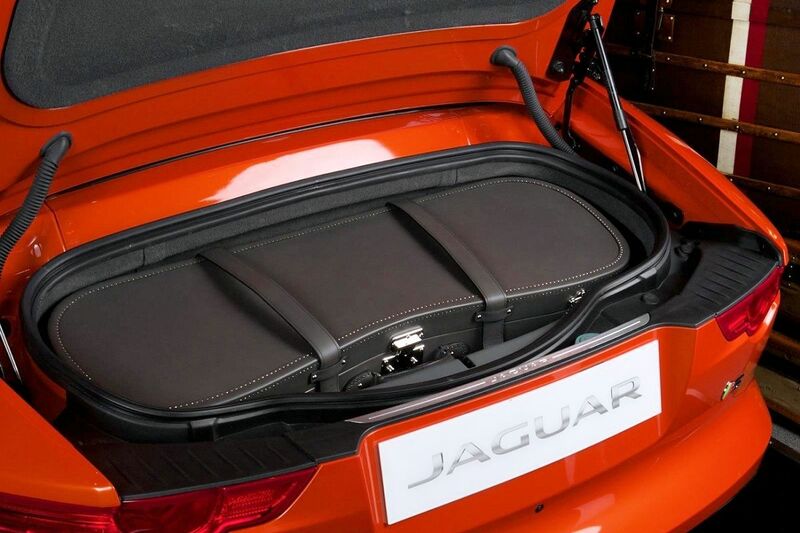 Jaguar has recently launched its own five piece fitted luggage set for the F-TYPE. Roundup: BELGIUM. Double the number of the usual speeding offences drivers – 6,227 – were recorded on Thursday as speed limits were reduced during the smog alert. Police were out in force as the motorway limit dropped to 90kmh. Despite oft repeated claims that cutting speed reduces congestion, @ANWBEuropa traffic report said the length of jams was also higher than usual on Thursday. FUEL. Who pays the most fuel duty in Europe? The RAC Foundation says the UK vies with Sweden at between 56-62% of the retail price. Last week we reported the Italians saying they paid the highest after the Croatians at 60.5%. RUSSIA. Olympics’ roads contractor Engtransstroy has folded after disputes with suppliers over charges it said in a statement. The issue is, Engtransstroy is laying the surface for the upcoming Russian Grand Prix.